Experience a UV-Free tan, and achieve a flawless, streak-free, and natural looking tan at Planet Sun, thanks to the revolutionary heated sunless treatment that will keep you warm & dry from start to finish! From the moment you enter the warm and inviting booth, your skin is infused with heat which allows for maximum absorption, creating a flawless & longer lasting tan. The sweeping side to side airbrush travels gently from head to toe applying precise amounts of your desired level of colour, while the flow of warm air keeps you dry and comfortable. The drying process accelerates the DHA development and improves the application process, leaving your skin soft and smooth immediately after the session. 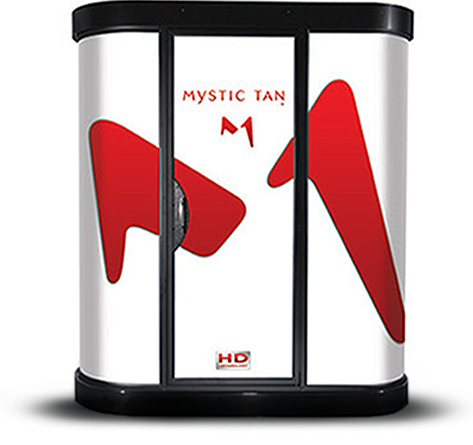 Mystic Tan® invented the original UV-Free tanning solution. Their new formulation technology features a proprietary blend of Paraben-Free ingredients that deliver a superior natural-looking tan. Customize your look for every style, season or event by choosing from multiple bronzers and scent shots, as well as an accelerator to enhance your skin tone and show off your tan in half the time. Erythrulose and DHA work in combination to produce a tan that lasts longer, fades more evenly, and provides a natural color for all skin types and tones. High concentrations of Aloe Vera, and added antioxidants such as Green Tea extract, Açai, and Larrea Divaricata, can help to protect your cells against damaging free radicals. The added odor control system helps eliminate the DHA development reaction odor. The formulations were developed in a fragrance-free, bronzer-free, clear base solution allowing for individuals to personally customize their sunless experience. the Mystic HD tanning booth. Application technology that attracts mist to every exposed surface of the skin. Spraying process with a sweeping side to side airbrush motion. Flexible choices to customize your tanning. Semi-transparent, perforated, deco wall system creates the feeling of an open air environment without sacrificing the feeling of privacy. Guides customers step-by-step through the entire tanning process. Washes the interior after each session. Automatically removes rinse water after each cleaning cycle. Quickly captures and removes excess spray particles during the spray session, and continuously replenishes fresh air. Call to book an appointment or just pop in during our regular hours. Take advantage of this tanning discount voucher.